Image file resolutions all those numbers. 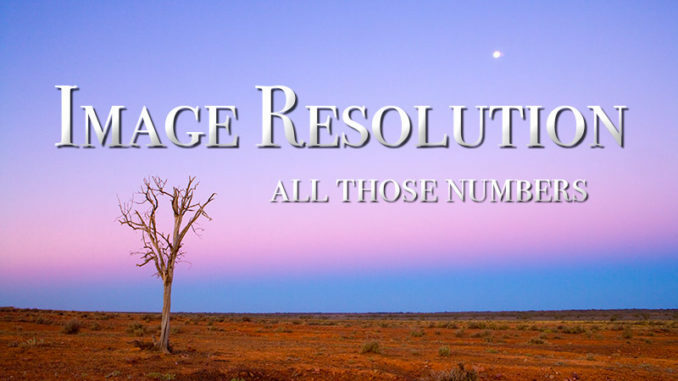 There is a lot of confusion around image file resolutions. We are regularly asked to supply a file at 300dpi. When we ask what size they need the file, we get a puzzled look or are told: “I just told you”. But, they haven’t told us. All they have told us is the print resolution, not the file size. Not wanting to write a ten-page documentary. Here is a much-simplified version. DPI, short for Dots Per Inch is a printing term referring to the number of ink dots laid on paper per linear inch. Three hundred DPI has become the accepted standard print resolution. Despite a lot of printing being carried out at other resolutions. For example, newsprint is very often printed below 100dpi. Because it is printed onto an absorbent paper stock, the individual dots tend to bleed or spread out as they soak into the paper. But back to digital file resolution. Rather than state DPI, we should be talking PPI or pixels per inch, This, however, still does not tell us how big the file needs to be. What we need to know as photographers, is how many pixels across the image. Mostly we ask for the number of pixels across the longest edge. As soon as we have this number we know exactly how large our files need to be. The old, I need 300dpi file is meaningless to us. Take, for example, someone asks for an image at 300dpi. I could supply an image that was 300 pixels across and it would likely be useless to them. Unless of course, they only wanted to print the image to a size of one inch. If they were enlarging the image to four inches across, they would have a shortfall of 900 pixels. Upsizing the file, in this case, would result in very low resolution and blurry print job. I’ve been told I need different image file resolutions for different purposes. While this is correct. In the real world in 2018, it is no longer a big deal. Or it shouldn’t be. For example, modern internet browsers are now sophisticated enough to do the conversion automatically. Although I would still advise uploading a file sized as recommended by the website you are supplying. For example, if their preferred size is 815 pixels across that is what I would upload. Uploading an image with fewer pixels across will generally result in up-sampling. Not a place you want to be if you’re a photographer who cares about how your pictures look. Conversely, loading an image bigger than recommended can result in auto down-sampling. That is sometimes really good and with some sites, BAD. Likewise, supplying photos for printing, you need to supply sufficient pixels to cover the area to be printed. Just make sure you know what print resolution they work on, and supply files with an adequate pixel count to do the job. Upsizing has its limits. The good news, however, most competent printers are very capable of down-sampling without loss of quality. Can I make money selling stock photos?